For Li Qingping, life is full of both adverse fortunes and legendary experiences. Her journey of art with ups and downs is not only a profound implication of China’ s modern art history, but also a vivid reflection of China’ s vicissitudes in politics and culture since the middle of the 20th century. She was spoken highly of by Liu Haisu as “the pioneer to bring in western paintings” and regarded by Xu Beihong as a “new women artist” in 1940s when she launched joint tours in Southeast Asia together with Liu Haisu and Situ Qiao and other people. However, in 1950s, the worst time in her life, she went through repeated imprisonment, transformation and surveillance, either physically in prison or mentally under dehumanizing conditions. It was not until early 1980s did the storm of New Enlightenment in the opening-up and reform of China’ s society provide Li Qingping, in her seventies, with miraculous opportunities for art creation, the thriving of which was stunning. At that time, China’ s modern art movement- “85′ New Wave Art” emerged. The modernity, romance, and unrestrained style with freedom and arbitrariness in Li Qingping’ s works greatly edified and inspired the new generation to pursue modern art. Her determination to sacrifice for art with an indomitable spirit without any complaint or regret even in an adverse situation, in particular, encouraged numerous young people in the “New Enlightenment” movement. Today this personal experience with mixed feelings and regrets both as an ordinary person and as a great artist is quite thought-provoking. An earnest thought of this meaning is undoubtedly the main academic goal of this exhibition after the first individual exhibition in 1986 held for Li Qingping by Hubei Artists Association in GuQin Tai of Wuhan, the 2008 “The Fragmentary shadow of Duckweed-A Donation Exhibition of Li Qingping” held by Shanghai Art Museum and “The Fragmentary Images of Qingping-An Art Exhibition of Li Qingping” held by Hubei Art Museum in 2009. Currently when the consumerist culture has permeated into every corner of the whole society, at least two levels of positively realistic meaning can be discovered from the review of Li Qingping’ s art and life, namely, and such review will enhance our spiritual pursuit of cultural subjectivity from aspects of art and life. In spite of many detailed and in-depth researches on the painting art in Li Qingping’ s later years, researchers are used to placing her in the same breath with many western artists like P.Gauguin, Vincent Van Gogh, Lautrec, Emil Nolde, Maurice Utrillo and even American pop artist Jasper Johns, the abstract expressionism artists Jackson Pollock and Willem De Kooning and so on. But except for the traceable preference for the art of P.Gauguin and Vincent Van Gogh, there is no substantial connection between the later art of Li Qingping and other artists. From her life path and the creation conditions in later years, her paintings all burst out from her life experiences, understandings and passions, within which we can be easily moved by the lively subjectivity in an artist’ s personality. The cultural features and spiritual energy within this kind of art have long been ignored and we can deepen the research of this problem through the case of Li Qingping. 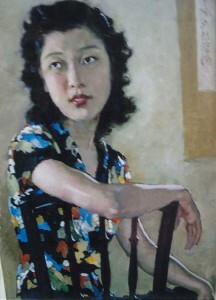 In the sense of society, reviewing the art and life of Li Qingping can also bring about our thought of subjectivity. So how can we possibly realize human freedom and liberty? How can we construct individualist social morality and value standards under the circumstance of commercialization and consumerism? We can find the answers to these questions from Li Qingping’ s art and life.